Jet Airways reported its third quarter (ending December 31) results for the fiscal year ending March 31 2017 (FY2017). With earnings of Rs 156.3 crores, the results were much below expectations and point to structural challenges. The results decline was driven by intense competition in the market, consistent fare sales and aggressive capacity addition – all of which added to the revenue pressures. Compared to the same quarter last year revenues only grew by 1.4% while capacity grew by 9.2%. As was the case with other airlines, Jet resorted to aggressive discounting focusing on higher load factors to mitigate lower yields. Load factors came in at 79.8% but were a good 10% points below low cost carriers. Perhaps the most challenging fact was that Jet’s cost of delivery per seat kilometer (CASK) was higher than the revenue earned per seat kilometer (RASK) and thus the difference would have to be made up via other income. Comparing capacity to the previous quarter, majority of the growth was on international sectors (13.4% vs Q3FY16) while the domestic capacity growth was a modest (2.9% vs Q3FY16). This was a good de-risking measure but due to 10% – 15% yield declines even on international sectors, it did not deliver strong revenue performance. This is perhaps best highlighted in the lower EBITDAR which came in at 18% for the quarter (YTD estimates are that EBITAR will be in the 19% – 21% range). The drying up of other income, mainly leasing income led to a sharp overall decline in profits and this quarter saw a 70% decline in profit before tax (vs Q3FY16). Profit margins were at 2.5% which were not enough to cover the cost of capital. The airline did further pay down its debt but by 1000 crores but overall debt levels are a cause of concern. For the quarter, Jet lost marketshare of 1% largely due to capacity induction by competitors. Results indicate that Jet is focused on maximizing asset utilization to deliver higher revenues. Operating fleet grew by 5 aircraft to 111. Average aircraft utilization was at 12.5 hours while 737 utilization came in at an impressive 13.1 hours (commendable as it was higher than some LCCs). The average seat count was also up by approximately 3% as a result of Jet deploying widebodies on shorter sectors including domestic routes. A330s were deployed on the Mumbai Delhi, Mumbai Bengaluru, Mumbai Chennai and Delhi Kolkata routes. 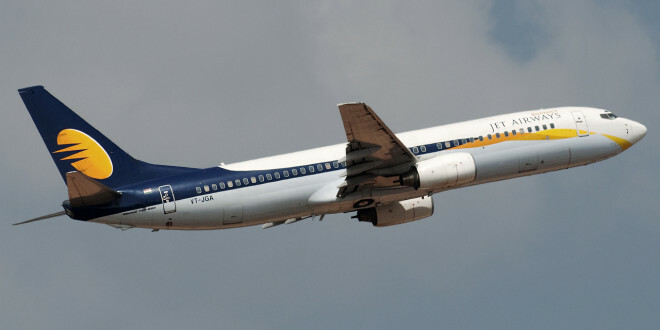 Jet is deploying these aircraft in a very smart manner where they then fly international sectors and if the route economics work well this would well be a source of advantage given the capacity constraints at airports coupled with the passenger experience on a twin aisle versus a single aisle. Additionally Jet is focused on leveraging technology to further drive efficiency (which was highlighted recently at the SITA conference in Goa). Jet Airways carried 60 lakh passengers (6.09 million) during the quarter and saw a codeshare traffic growth of 7%. This codeshare feed will be critical to Jets success and the quarter saw enhanced codeshares with Qantas, All Nippon Airways, Korean Air, Bangkok Airways, Garuda Indonesia, and Kenya Airways. For success on the long-haul and trans-atlantic market, Jet enhanced its codeshare partnership with Delta Air Lines and Air France (also leveraging their hub presence in Amsterdam). Most interestingly, the quarter saw Jet Airways increase capacity to Dubai while capacity to Abu Dhabi continued at previous levels. Jet Airways is clearly focusing on the international routes. With the intense fare wars and competition in the domestic market (especially on the premium product by Vistara), this trend is likely to continue. This was evident in this quarter where new flights were introduced. As reported by Bangalore Aviation earlier 777s (returned from Etihad) were deployed to upgrade routes to Singapore, Dubai, Amsterdam, Hong Kong, Amsterdam and Toronto. On product, Jet is attempting to match Singapore Airlines and Emirates but the challenges continue on the network side. Jet Airways is also focusing on the shorter segments which may deliver a higher return. While it has been aggressively pursuing bilaterals and involved in stakeholders consultations (held by the ministry) as quick wins one saw additional flights to SAARC countries (no bilateral restrictions), additional flights to Colombo (no bilateral restrictions) and widebodies to Dammam, Jeddah, Kuwait and Bangkok (where Jet can move faster on deployment compared to LCCs). On the fleet side, Jet Airways ended the quarter with 103 operational aircraft. This included 17 widebodies, 18 regional (ATRs) and the balance 737s. Sources indicate that the airline will add 10 – 12 Boeing 737 Aircraft in its fleet for the short term via dry leases expanding the fleet to 86 – 88 aircraft. Jet also has 75 737Max aircraft on order which it will start receiving in 4QFY18 onwards. 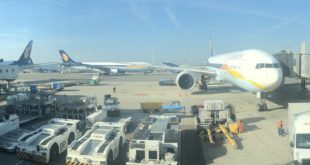 The future of the A330s remains uncertain and at some point Jet Airways will benefit from rationalizing their fleet (the 777s provide an overall higher capacity and range for Jet Airways long haul flights). The quarter was extremely challenging for Jet Airways and current forecasts don’t see much of an improvement. With falling yields, rising fuel costs and a high debt load, Jet Airways will have to continue to focus on additional revenue generation and attack each cost element to effectively compete. 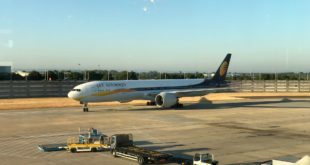 JetLite continues to be a strain and it remains to be seen if Jet Airways will spin this off or continue with it as a separate entity (as it also enables them additional slots). With Jet Airways cost of delivery (CASK) being 20% – 25% higher than the LCCs, it makes it extremely tough to compete in the domestic market. Our analysis indicates that the international market and especially Jet Airways’ premium product coupled with its loyalty programs will be key to its future success. In the short-term Jet will continue to face significant headwinds and it remains to be seen how these will be addressed. Next Video: Making the Air India A320neo. India has maximum neo operators.